The host asked the owner to put together a menu for tonight, and given that she is a wine lover herself and knows exactly what we are doing tonight, one can only assume that she was deliberately trying to screw with our palates... perhaps on Curry's orders! Japanese-style fried chicken (日式炸雞件) - pretty good. Deep-fried dish #2. Deep-fried tofu with black truffle (炸黑松露豆腐) - curious thin sheets of bean curd with blobs of black truffle paste on top. Not bad at all. Deep-fried dish #3. Marinated boneless pig trotters (涼拌無骨豬手) - oh this was so sooo good... I'm a sucker for pig trotters, thanks to all that skin and fat and gelatin and collagen... which can be simultaneously soft, springy and crunchy. Marinated with sesame oil, with plenty of chopped chili and spring onions... there is just enough kick here. I found myself unable to stop reaching for more. Chili/spicy dish #2. Crab meat and mushroom soup (生拆蟹肉多茸羹) - nice and thick thanks to the abundance of corn starch, but we've got really nice and big chunks of fresh crab meat here. Very, very yum. Was that a sprinkle of deep-fried garlic and chili flakes on top? Deep-fried crab claw (椒鹽大肉蟹箝) - mmmmm more deep-fried food, and more deep-fried garlic and chili. Let's just say that the crab that this claw came from wasn't exactly a baby. Chili/spicy dish #3 and deep-fried dish #4. Baked garoupa fillet with corn in cream sauce (鮮粟米奶油焗斑球) - oh this is so Canto... The cream was really, really nice. Surprisingly, though, this dish was spicy! Quite a few of us were caught by surprise, fooled by the heavy cream and veg. Chili/spicy dish #4. Stir-fried pork neck with dried shrimp (蝦米醬爆豬頸肉) - aaaaaand another spicy dish... this time a lot more in-your-face. Just looked at the chili oil with seeds and chopped dried shrimp and shrimp paste covering the pork and celery. Another dish where I couldn't resist reaching out my chopsticks for more and more, red Bordeaux be damned. Chili/spicy dish #5. Crispy chicken (南乳脆燒黃油雞) - really yum... and the prawn crackers were so nice... Deep-fried dish #5. Baked four vegetables in whole pumpkin with Portuguese sauce (原隻南瓜葡汁焗四蔬) - anything smothered in molho português tastes pretty good in my book, and this was no exception. Broccoli, cauliflower and mushrooms. Chili/spicy dish #6. Before we even showed up, Curry had announced that this would be a magnum dinner with 6 big guns. We were, of course, kinda hoping that we would be drinking 6 magnums of Jayer... but none of us would have cause to question his generosity once we tasted the wines and realized what they were! 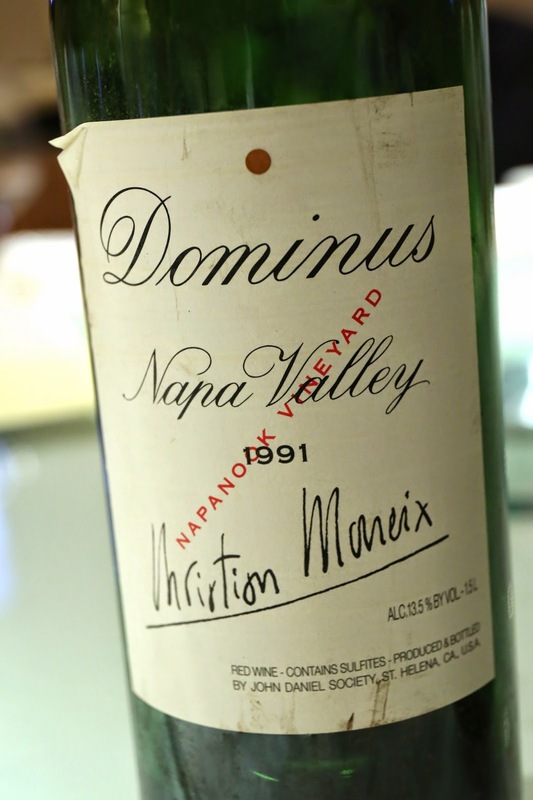 1991 Dominus from magnum - nice and smooth on the palate, with a little cedar, a little grassy, bigger and more smoky than the Harlan, a little spicy. Later on pretty savory. 1991 Harlan Estate from magnum - nice, sweet fruit, with a hint of grass, mint and a tad savory mineral. 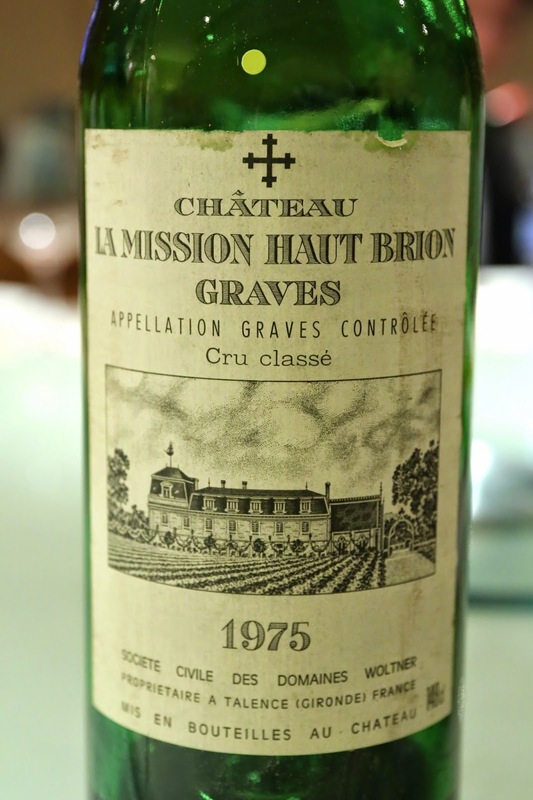 1975 La Mission Haut-Brion from magnum - nose seemed very oxidized at first, kinda dusty but cleared up later. Nose of grilled meats, coffee, and mocha. Later on turned pretty savory. 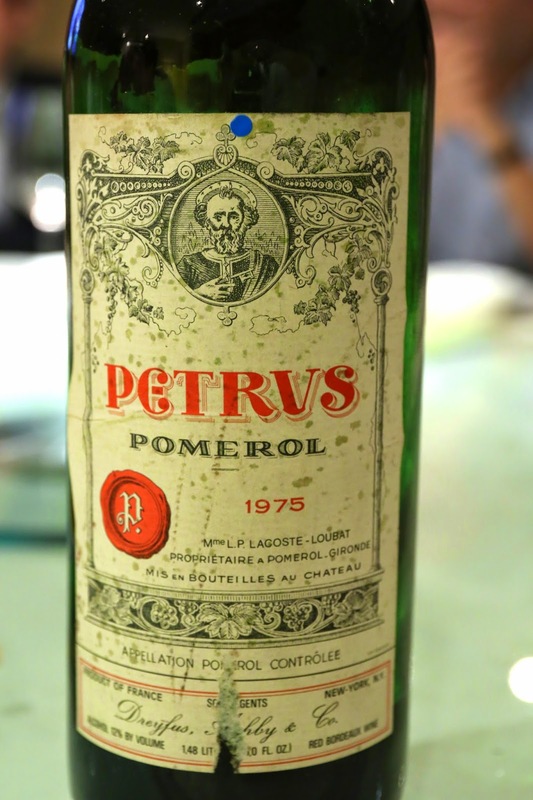 1975 Petrus from magnum - some fruit here and a little minty. 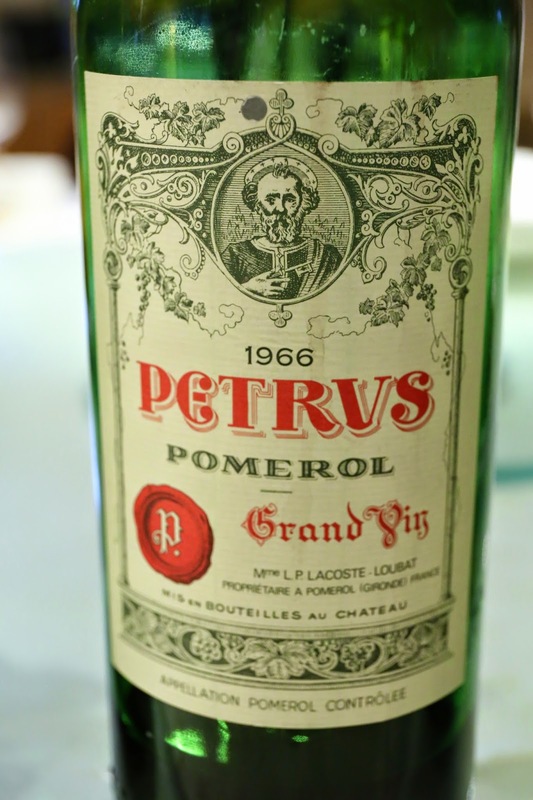 1966 Petrus from magnum, ex-château - more concentrated than the '78. Minty, metallic, a little sweet, a little smoky, and almost coffee notes. Definitely a better wine than the '78. 97 points. 1978 Petrus from magnum - cool fruit, lovely and elegant. Slightly ripe and sweet. 96 points. 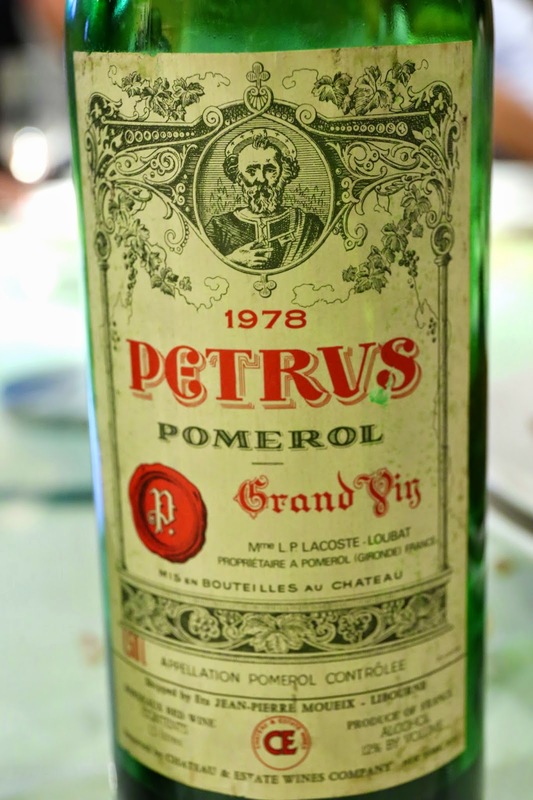 In case anyone was wondering... yes, you can drink Petrus with spicy food. Oh, this would be a treat for anyone who likes deep fried food. The tofu looks appealing. What, no holes in my tablecloth? !